Who doesn’t love a good old South African braai? If you don’t there is something wrong with you (jokes its not for everyone). I love that smokey braai smell that permeates from every porous object on your body – think hair, jeans, jerseys and so on. The second part about a braai is that its often the perfect opportunity to meet new people. This was one such braai. It happens when you start dating someone, you need to meet the people in their lives. It’s a wonderful chance to get to know people because it’s relaxed. Rik took me to his friend, Geh’s, new spot in Higgovale. After the 52 million steps to get up to his rad spot I was slightly out of breath but immediately welcomed into this new circle of people. Conversation flowed and it was awesome to see what nice neighbours he has, it was so friendly and one neighbour came to use our fire to cook her burger patties. Very unlike my block where I hardly ever see my neighbours, let alone feel comfortable enough to ask them to braai for me! Haha something I think we could all learn from. Make friends with your neighbours! Anyways back to the braai. We had my favourite braai broodtjies as well as the most yummil delish ostrich wors. There was plenty of food, a wonderful salad – served in a colander (new flat and all his stuff hadn’t arrived from Aus yet… boys are resourceful though) and a potato salad Rik made. He added feta cheese, red onion and fresh parsley, my new favourite additions to this simple braai staple. It was a wonderful evening and I’m kicking myself for not taking a pic of the incredible view from his flat! 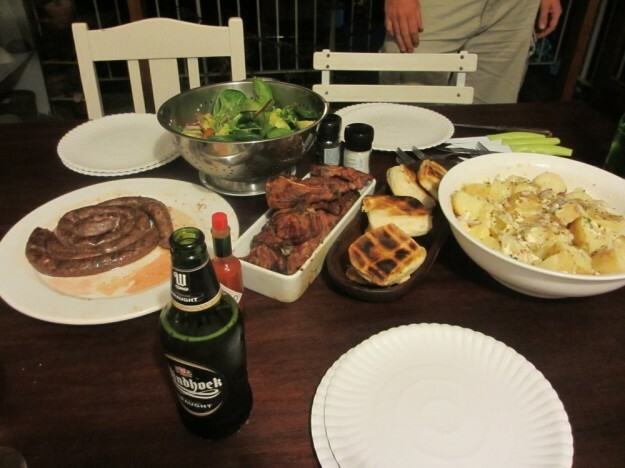 This entry was posted in Eat and tagged braai, fun times, new friends. lovely blog; It was rad to have you there! lets do it again sometime – ive got more utensils this time! Yippeeeeeeeeeeeee! I’m in 🙂 I personally love the colander! Relax. The view won’t disappear. There’s nothing better than a good braai. All looks good.